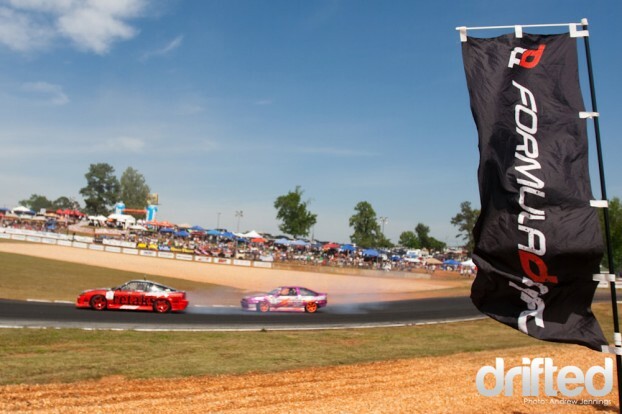 You’ve seen a teaser from Zak Kerbelis, and a sweet mix from Dan Cyr, but now it’s time to get into the real details and see what made this year’s Formula Drift event from Road Atlanta truly special. I can say without a doubt that the 2011 installment was one for the history books. Case in point: the weather. Mother nature saw fit to grace us with the best temperatures and some of the clearest skies I’ve ever experienced in the Southeast. The wind was also key – enough to cool you down, but not strong enough to eliminate the tire smoke from the track before it could be savored. 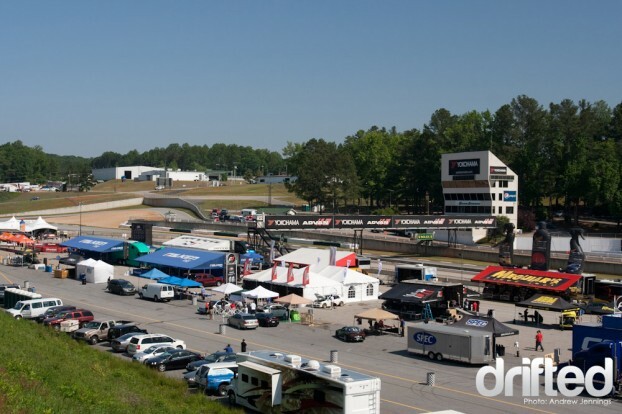 Road Atlanta is a track that offers just about everything that a racing fan could ask for. The paddock (seen below) is wide open with full access to the cars as they are being prepped. Seating is wherever you put your rear on one of the many grass hills overlooking the main corners. 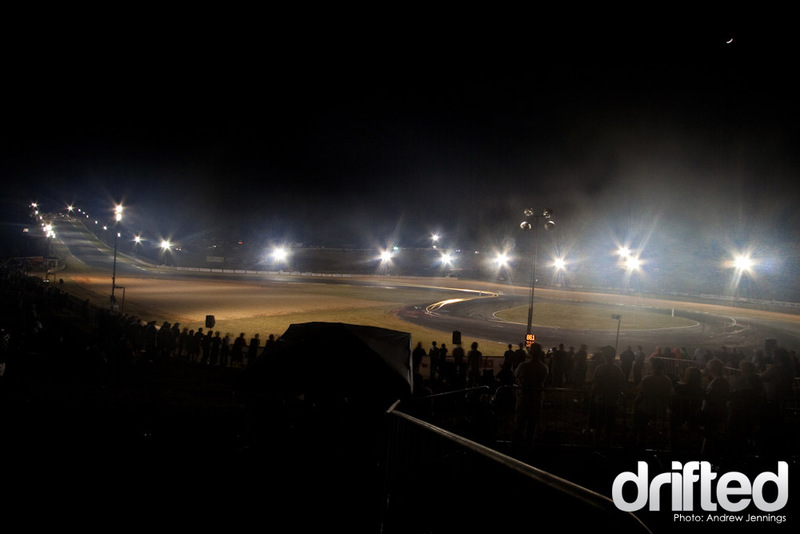 Then there are the lights lining the track. They allow for true night racing unlike most of the venues on the Formula Drift calender. Add it all up, and you’ve got one sweet way to spend a weekend. 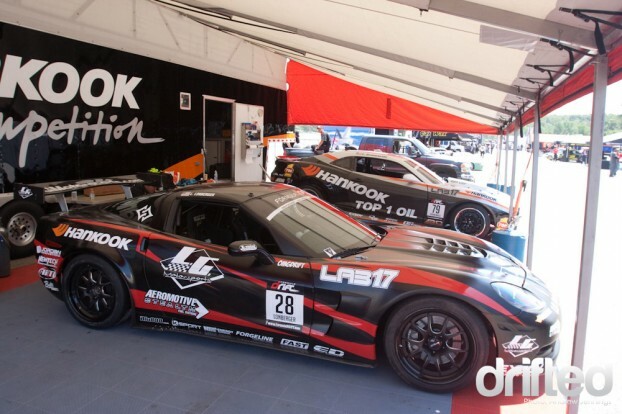 To compete, each car must pass a thorough inspection by the Formula Drift judging staff. In the past, this was a piece of cake. Do you have 4-wheels, a motor, and the stock chassis? Good to go! For 2011, things are a little bit more rigid. A new rule was introduced that limits the tire width based on the weight of the vehicle. The lighter the car, the thinner the tires must be. To verify this, all cars were weighted in like a pay-per-view special, and their tires were checked against the regulation. Later on we’ll discuss how this did – or did not – impact the racing results. Hankook was one team that didn’t have to worry about this rule. Among the new whips in attendance was the Blu808.com Corvette C6 piloted by Luke Lonberger. He joins veteran Conrad Grunewald’s Hankook Camaro SS to round out the American muscle lineup. Speaking of American muscle, over at the Team Need for Speed booth Vaughn Gittin Jr.’s custom RTR-X Mustang was on display. Courtney Day was generous enough to pose with the beast for a few shots. While just a show car for now, here’s to hoping that it will see some track time before the end of the year. 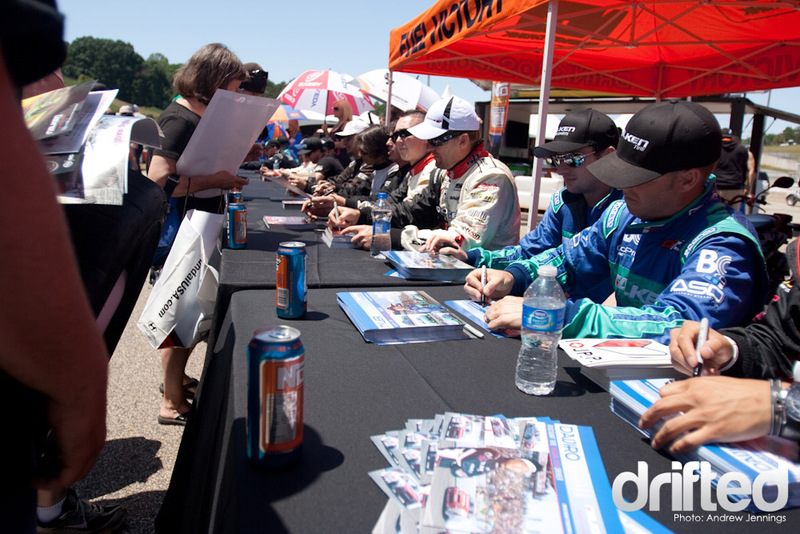 As always, the autograph session drew a huge crowd of fans. If you have the chance to attend one of the other Formula Drift events this year, make sure you hit up this line. Rumor has it that a few of the notables may not be racing next year. Here, Taka Aono put his mark on one of the more popular souvenirs: a used tire. I honestly don’t know what people do with those tires after they leave the track. The inner lip is cut by the teams so that it can’t be mounted on a wheel. Maybe it makes a good coffee table? Any good drift sponsor will bring an umbrella girl or two for their driver. Hankook was kind enough to bring four, and they were all experts at smiling for a camera. After the autograph session it was time to head back over to the track for some open practice. This would be the first time to evaluate if the new tire-to-weight regulation had any noticeable impact. The rule’s intention is to bridge the gap between the big budget small cars, and the lower budget lightweights. Most privateers in Hachis or 240s were running slim tires for cost reasons anyway, so this forces the title sponsor teams to do the same. With less rubber, the car’s straight line speed will be more limited, evening out the field… in theory at least. In reality, it managed to have very little effect on the speed and outcome of tandem racing. Road Atlanta proved that the sport of drifting is really about two things: driver skill, and car reliability. Fast cars were fast, and slow cars were slow. Cars that broke down, didn’t race. One unlucky victim: Rhys Millen. Normally a contender for the podium at Road Atlanta, his Red Bull Hyundai Genesis Coupe only managed two passes in practice before calling it a day. He was unable to qualify for the top 32 bracket. As night fell on day 1, the track lights came on to let the drivers have a shot at sideways practice in the dark. 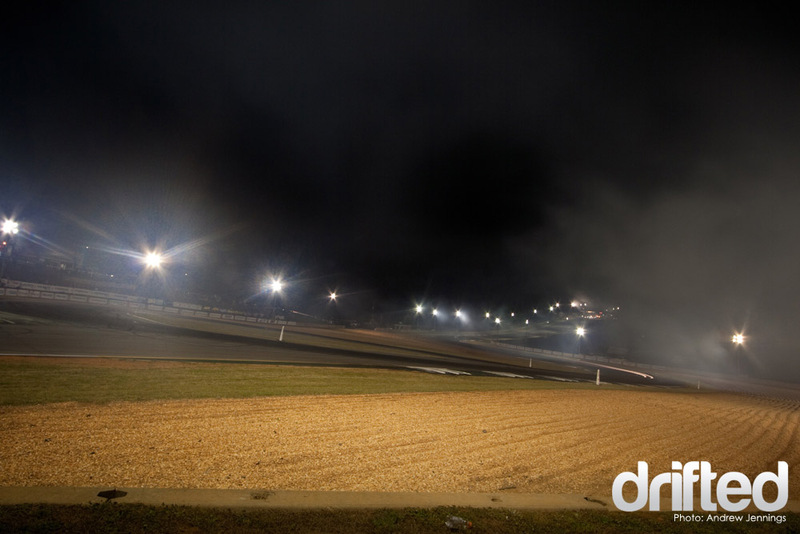 These shots show the full lap of the Road Atlanta drift course. Cars begin on the left at the top of the hill and accelerate down the long straight. There is a left, then long right transition that brings them into the semi-circular “horseshoe” feature. As they exit, a quick up-shift will allow the cars to power all the way back through the first series of corners and up to the start/finish line again. Entries into the tricky first turn (dubbed 10A by the track’s official map) and the long, off camber departure from the horseshoe are the two areas that define a lap here. I really enjoy watching drift action at night, but most of the cars in the US series do not take full advantage of the moment. In Japan, D1 cars have been adding small glow rods to their wheels, engine bays, wings, and just about everywhere else for years. These light arrays add to the excitement of the sport and make the cars look like ticking time bombs. A black car against the black tarmac can easily get lost to spectator eyes without them. Amid this sea of conservatism in the Formula Drift lineup, Matt Waldin’s Helix Energy Nissan 350Z easily popped with a new string light across the car’s front fender and roof line. It didn’t hurt that his car continues to backfire sweet flames from both exhaust pipes either! One car that did not require any additional bling to be noticed was Fredric Aasbo’s Team Need for Speed Scion tC. Tanner Foust may have retired for 2011, but another smoking Scion has filled the gap. The full trails of smoke that Aasbo created all weekend were quite a sight. That’s it for now. Thanks for reading, and stay tuned for more coverage from Road Atlanta as we recap the highlights of qualifying and the main event.